Dental implants have become the gold standard for tooth replacement. Implants are versatile. If you are only missing one tooth, one implant plus one replacement tooth will do the trick. If you are missing several teeth in a row, a few strategically placed implants can support a permanent bridge. Similarly, if you have lost all of your teeth, a full bridge or full denture can be permanently fixed in your mouth with a strategic number of implants. 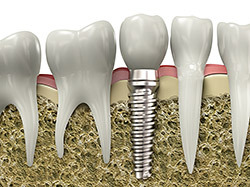 A dental implant is a titanium oral screw that replaces a missing tooth. 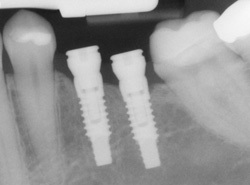 Implants are a single unit, making them very strong with a low failure rate. Dr. Elise Braxmeyer has completed comprehensive training regarding dental implants. She is able to place most implants herself in the comfort of our Beaverton, OR dental office. Cases that are more difficult may be referred out to one of our trusted local periodontists or oral surgeons. Dental implant placement and restoration is a straightforward process. Once the failed tooth has been removed and any bone grafting completed if needed, the implant is placed into the jawbone and left to heal for three to four months. After the implant has integrated to the bone, the crown is created and placed and the tooth is completely restored. Whether you have your implant placed at Hillside Dental Care or with a specialist, Dr. Braxmeyer will coordinate all aspects of your treatment. She ensures that all steps are fully understood to make the surgical and restorative aspects of implant treatment as seamless as possible. Dental implants are often chosen because of their strength, stability, and aesthetics. Unlike a bridge, which relies on adjacent teeth for support, a dental implant is a solid, standalone unit. Similarly, dentures are not affixed to the bone, which can lead to difficulty eating and speaking. Implants not only look more natural, but feel and act more like normal teeth, with a stronger biting force. Consider your dental implant to be the same as a natural tooth. It requires the same daily brushing and flossing, and the same amount of preventive checkups at Hillside Dental Care. Just like a natural tooth, the better you take care of your implant, the longer it will last. Ask Dr. Elise Braxmeyer of Hillside Dental Care in Beaverton, OR if you have any questions about dental implants.